Republic Day 2019 Chief Guest: Republic Day honours the date on which the Constitution of India came into effect on 26 January 1950 replacing the Government of India Act (1935) as the governing document of India. The Constitution was adopted by the Indian Constituent Assembly on 26 November 1949 and came into effect on 26 January 1950 with a democratic government system, completing the country's transition towards becoming an independent republic. 26 January was chosen as the Happy Republic Day because it was on this day in 1930 when Declaration of Indian Independence (Purna Swaraj) was proclaimed by the Indian National Congress as opposed to the Dominion status offered by British Regime. United States President Donald Trump will not be visiting India after all to be the chief guest at the Republic Day celebrations next year, top government sources confirmed to this newspaper on Thursday. “President Trump will not be the chief guest for India’s Republic Day next year,” a source confirmed. The government was hopeful that the US President would attend but has received information that a visit at that time will not be possible. New Delhi will now have to look at other options among world leaders for a chief guest for the Republic Day ceremony. It may be recalled that the US administration had stated in August this year that an invitation had been extended by India but that no final decision had been taken as yet on President Trump attending. But with the Indian R-Day just three months away, Washington has taken the decision. Sources maintained that the Indian government was keen that President Trump visit the country and that a date for the official visit could be finalised even after Republic Day. Sources maintained that the invitation had not been specific to Republic Day but it is clear that the government was keen that President Trump attend as the chief guest. While no reasons could be ascertained for the decision, the US President’s busy domestic commitments are believed to be the reason for the decision. President Trump is apparently scheduled to deliver the State of the Union Address to the joint session of the US Congress around the same time. The address, according to reports, “includes a budget message and an economic report of the nation, and also allows the President to propose their outlined legislative agenda and national priorities”. Iranian oil if they want to escape US sanctions. New Delhi is “cautiously optimistic” that US sanctions won’t be imposed on it but is nevertheless prepared to weather it. Had President Trump attended, he would have been the second US President in the current tenure of the Modi government to be the chief guest at India’s R-Day celebrations. President Barack Obama had attended the Republic Day parade on January 26, 2015, as chief guest. The current tenure of the Modi government has seen Indo-US ties go from strength to strength despite the mercurial and unpredictable nature of the Trump Presidency. India and the United States had held their “inaugural 2+2 dialogue” at the foreign and defence ministerial level in New Delhi just last month on September 6. Minister of external affairs Sushma Swaraj and defence minister Nirmala Sitharaman had hosted the US Secretary of State Michael R. Pompeo and US Secretary of Defence James Mattis in New Delhi on that day for the 2+2 dialogue. 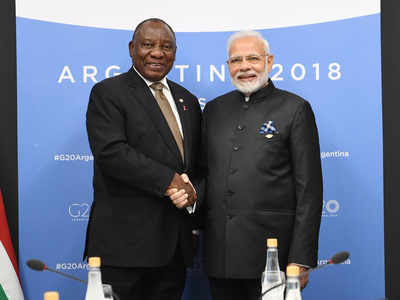 Prime Minister Narendra Modi on Saturday met South African President Cyril Ramaphosa on the sidelines of the G-20 summit here and invited him to be the Chief Guest at the Republic Day celebrations next year, which also marks the 150th birth anniversary of Mahatma Gandhi. The South African leader accepted the invitation to grace the occasion. “Glad to have met President @CyrilRamaphosa. At a time when India is marking the 150th birth anniversary of Mahatma Gandhi, it is our honour to welcome President Ramaphosa as the Chief Guest for the 2019 Republic Day celebrations. Bapu’s close link with South Africa is well known,” Modi tweeted after the meeting. Following the meeting between Modi and Ramaphosa, External Affairs Ministry spokesperson Ravish Kumar tweeted, “150 years of Mahatma & 100 years of Madiba!” He was referring to July 18 this year, which marks 100 years since the birth of the global icon Nelson Mandela, also popularly known as Madiba, who died in 2013 at the age of 95.